Sloth Tour La Fortuna Arenal Volcano area. 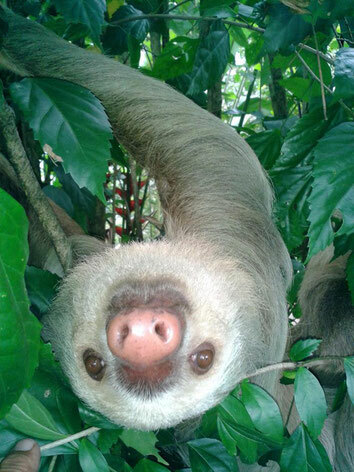 For those who choose to enjoy their vacations in Costa Rica and specifically in the surroundings of La Fortuna and Arenal Volcano, the sloth has become one of the most wished animals that people want to see in our forests. A lot of people wonder, ¿why are they so slow? In fact, this is its biggest feature with his smiling face and full of tenderness when carrying their babies. Also, it is usually the reason why they have received the name of sloths. However, getting to know this animal, will help you to understand that beyond of being sloth, is a worker and very intelligent animal. ¡Our naturalist guide will tell you! Naturalist guide, connoisseur of the behavior and preferences of the sloths, will go with you on the tour where it is guaranteed that these beautiful animals will be observed. Without altering their natural conditions you can see them very close to make a beautiful photograph. The type of forest that surrounds the Arenal Volcano area is ideal for many sloths to make their home. 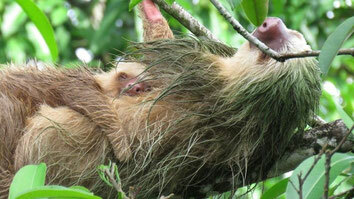 We will pick you up at your hotel to go to the place where the sloth and other beautiful species of birds live. This complete tour lasts approximately 3 hours, where you will live an enriching experience in an environment full of nature. Free for kids under 5 years old.